Where is this place? And how is it here, now? 1/40 sec., f/5.6, ISO 320, 24mm. THERE ARE TIMES WHEN A CAMERA’S CHIEF FUNCTION IS TO BEAR WITNESS, TO ASSERT THAT SOMETHING FANTASTIC REALLY DID EXIST IN THE WORLD. Of course, most photography is a recording function, but, awash in a sea of infinite options, it is what we choose to see and celebrate that makes an image either mundane or majestic. And then sometimes, you just have the great good luck to wander past something wonderful. With a camera in your hand. The New York Public Library’s main mid-town Manhattan branch is beyond magnificent, as even a casual visit will attest. However, its beauty always seems to me like just “the front of the store”, a controlled-access barrier between its visually stunning common areas and “the good stuff” lurking in untold chambers, locked vaults and invisible enclaves in the other 2/3 of the building. I expect these two worlds to be forever separate and distinct, much as I don’t expect to ever see the control room for electrical power at Disneyland. But the unseen fascinates, and recently, I was given a marvelous glimpse into the other side at the NYPL. A recent exhibit of Mary Surratt art prints, wall-mounted along the library’s second-floor hall, was somehow failing to mesmerize me when, through a glass office window, I peeked into a space that bore no resemblance whatever to a contemporary office. The whole interior of the room seemed to hang suspended in time. It consisted of a solitary woman, her back turned to the outside world, seated at a dark, simple desk, intently poring over a volume, surrounded by dark, loamy, ceiling-to-floor glass-paneled book shelves along the side and back walls of the room. 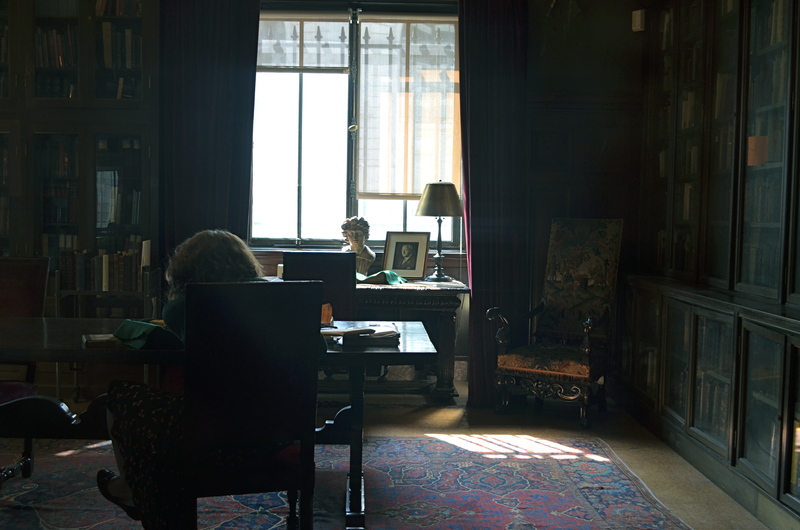 The whole scene was lit by harsh white light from a single window, illuminating only selective details of another desk nearer the window, upon which sat a bust of the head of Michelangelo’s David, an ancient framed portrait, a brass lamp . I felt like I had been thrown backwards into a dutch-lit painting from the 1800’s, a scene rich in shadows, bathed in gold and brown, a souvenir of a bygone world. I felt a little guilty stealing a few frames, since I am usually quite respectful of people’s privacy. In fact, had the woman been aware of me, I would not have shot anything, as my mere perceived presence, however admiring, would have felt like an invasion, a disturbance. However, since she was oblivious to not only me, but, it seemed, to all of Planet Earth 2013, I almost felt like I was photographing an image that had already been frozen for me by an another photographer or painter. I increased my Nikon’s sensitivity just enough to get an image, letting the light in the room fall where it may, allowing it to either bless or neglect whatever it chose to. In short, the image didn’t need to be a faithful rendering of objects, but a dutiful recording of feeling. How came this room, this computer-less, electricity-less relic of another age preserved in amber, so tantalizingly near to the bustle of the current day, so intact, if out of joint with time? What are those books along the walls, and how did they come to be there? Why was this woman chosen to sit at her sacred, private desk, given lone audience with these treasures? The best pictures pose more questions than they answer, and only sparingly tell us what they are “about”. This one, simply, is “about” seeing a woman in a time machine. Alice through the looking-glass. A peek inside the rest of the store. This entry was posted on July 14, 2013 by Michael Perkins. It was filed under Available Light, Composition, darkness, Exposure, History, ISO, Light, New York, Viewpoint and was tagged with Books, Composition, dark, exposure, low light, Manhattan, New York City, New York Public Library.